John Zachary DeLorean was born in Detroit in 1925. Like many automotive executives of his era, he was a second-generation automobile man; his father, an immigrant from Alsace-Lorraine, had worked for a time as a millwright for Ford. As a teenager, DeLorean earned a scholarship to Lawrence Institute of Technology (now Lawrence Technological University) and, after a brief stint as an insurance salesman, took a job with the Chrysler Corporation. In 1952, he joined the Packard Motor Car Company, working with Forest McFarland, Packard’s chief R&D engineer, on projects like the second-generation Ultramatic transmission. Packard was quite small by the standards of domestic automakers, with a deeply ingrained culture of unhurried Old World craftsmanship. Largely unencumbered by bureaucracy and nurtured by the ever-patient McFarland, DeLorean thrived, enjoying a level of autonomy rare in a conservative industry. When McFarland departed to join Buick in 1956, DeLorean was promoted to replace him as head of R&D. If the Studebaker-Packard Corporation had been healthier, DeLorean might have enjoyed a fine career there. Unfortunately, by 1956, the company was staggering toward collapse. That summer, the Studebaker-Packard board decided to eliminate Packard’s own design and manufacturing facilities, consolidating development and production at the Studebaker plant in South Bend, Indiana. DeLorean started looking for other job opportunities. He was soon contacted by Oliver K. Kelley, then the head of GM’s corporate Transmission Development Group (and one of the principal architects of the original Hydra-Matic and Dynaflow transmissions). Kelley made a concerted effort to recruit DeLorean and arranged a series of interviews for him, including a meeting with new Pontiac general manager Semon E. “Bunkie” Knudsen. Although DeLorean was wary of GM’s top-heavy corporate culture and put off by Pontiac’s stodgy reputation, Knudsen convinced him that they could reinvent Pontiac and offered him a lucrative salary (around $14,000 a year, a handsome sum in the mid-fifties) to become the head of Pontiac’s new advanced engineering section. DeLorean arrived at Pontiac on September 1, reporting to new chief engineer E.M. (Pete) Estes, whom Knudsen had recently recruited from Oldsmobile. DeLorean’s role was to develop new engineering concepts that might eventually find their way into production Pontiacs. As at Packard, he was given a free hand to explore novel and sometimes radical ideas, ranging from a rear transaxle with an unusual flexible driveshaft (later used for the 1961 Pontiac Tempest) to an experimental six with an unusual combination of air- and water-cooling. By 1959, DeLorean had embarked on a new project: an advanced six-cylinder engine with a single belt-driven overhead camshaft. We should pause here to explain a little bit about camshafts for the benefit of our less technically inclined readers. As you probably know, internal combustion engines produce power by burning both fuel and air. A four-stroke reciprocating piston engine — the type used by the large majority of cars and trucks — draws air and fuel into the cylinders, compresses it, ignites and burns it (either via an electrical spark or the heat of combustion), and then expels the burnt exhaust gases. Reciprocating engines generally use spring-loaded poppet valves to admit air into the cylinders and expel the exhaust. In a four-stroke engine, each valve must open and close once for every two rotations of the engine’s crankshaft. When the valves open (timing), how far they open (lift), and how long they stay open (duration) all have a dramatic effect on how the engine performs. Naturally, a reciprocating engine needs some mechanism to open and close the valves at appropriate times. This is generally accomplished with a camshaft, a metal shaft with a series of lobes that actuate the valves as the shaft rotates. The shape and position of those lobes (the cam profile) determine the valve timing, lift, and duration. 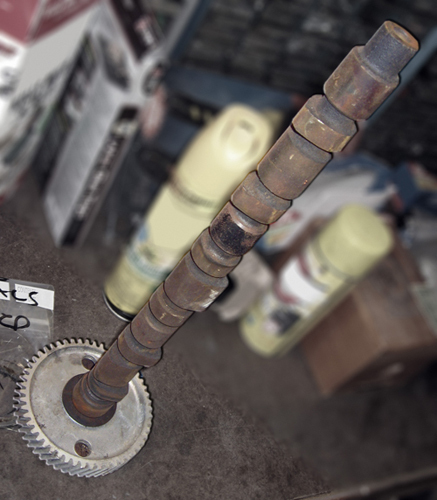 A typical mid-sixties automotive camshaft. This one is from a 1966 Chevrolet Corvair. Figuring out where to put the camshaft presents a number of challenges for engine designers. The camshaft must be driven by the crankshaft and turn at one-half the crankshaft speed. The simplest way to achieve that is to mount the camshaft in the engine block, just above the crankshaft, and drive it with gears or a short metal timing chain. 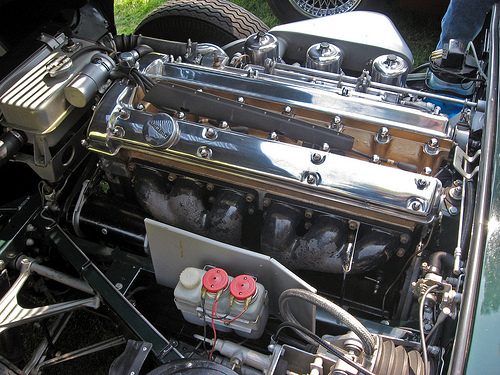 Until well into the 1970s, the vast majority of engines were cam-in-block designs. Mounting the cam in the block is reasonably convenient for L-head (flathead) engines, where the valves are also in the block, but it poses some challenges for overhead valve (OHV) engines, which became predominant after World War II. As the name implies, an OHV engine mounts the valves in the cylinder head, which improves breathing and thermal efficiency. The problem is that it puts the valves some distance away from the crankshaft. Therefore, if the camshaft is in the block, it must actuate the valves remotely via pushrods and rocker arms. That, in turn, increases the inertia the camshaft must overcome each time it opens or closes the valves; the camshaft lobe must act on the mass of the pushrods and rockers, as well as the valve itself. That extra mass (and any slack in the linkage) limits how high and how quickly the engine can rev. At very high engine speeds, the valvetrain can develop more inertia than the camshaft can overcome, leading to a condition called valve float. These problems can be mitigated somewhat by minimizing the mass of the valvegear and using stiffer valve springs, but a simpler alternative is to mount the camshaft in the head rather than in the block. 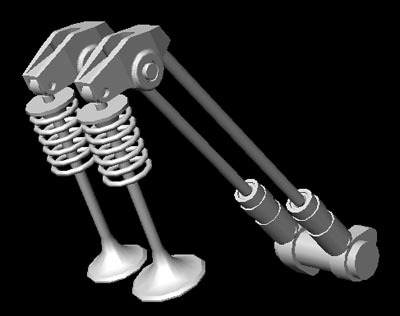 An overhead camshaft (OHC) engine needs no pushrods; depending on the position of the cam in the head, it can potentially eliminate rocker arms as well, greatly reducing the mass and inertia of the valvegear. The reduction in valvetrain mass not only enables the engine to rev higher, it increases the acceleration and deceleration rate of the valves. That allows the valves to be open longer (longer duration), which improves power, while minimizing the time the intake and exhaust valves are open simultaneously (overlap), which makes the engine smoother at idle and at low speeds than a pushrod engine with the same cam profile. Inevitably, there are trade-offs. First, OHC engines tend to be taller than comparable pushrod engines, which can complicate packaging. Second, overhead-cam engines (and particularly engines with dual overhead cams) are usually somewhat heavier than pushrod engines and have a higher center of gravity. Third, an OHC V6, V8, or V12 requires two camshafts — four with dual overhead cams — while a pushrod engine can get by with one. Fourth, the camshaft still needs to be driven by the crankshaft, which becomes more complicated the further the camshaft is from the crank. OHC engines may use a long timing chain, a rubber belt, gears, or shaft drive to run the camshafts, any of which adds complexity and cost. Those trade-offs made OHC engines quite rare in American-made cars until the 1980s. There were exceptions going as far back as 1904, but most were either competition engines or cost-no-object luxury cars like the DOHC Duesenberg Model J. The closest any American OHC engine came to mass production was the Wills Sainte Claire of the twenties, which accounted for fewer than 14,000 sales in an eight-year run. Other than the Pontiac OHC six, the only production overhead-cam engines in America between 1945 and 1970 were the short-lived Crosley CoBra four and the Willys/Kaiser Tornado engine, an OHC conversion of an older 226 cu. in. (3,622 cc) flathead six. The Tornado six was short-lived in America — Kaiser Jeep dropped it after 1966 except for certain military trucks — but it was used by Kaiser’s Argentine subsidiary, IKA, into the early eighties. Alfa Romeo was one of the few automakers of the fifties to adopt dual overhead camshafts; one cam operates the intake valves, one cam the exhausts. DOHC engines are more complex and more expensive than single overhead cam (SOHC) engines, but minimize the reciprocating weight of the valvegear and allow more efficient placement of both the valves and the spark plug. European automakers were quicker to adopt overhead camshafts, although they did not become common for mass-market cars until the sixties. They eventually became nearly universal on European and Japanese engines as a way of extracting more power from relatively small displacements. In the early sixties, six-cylinder engines were enjoying a modest resurgence in the American market. A decade earlier, buyers had shown a marked preference for the new breed of OHV V8s, leading some mid-priced automakers to abandon sixes entirely. Pontiac had dropped its venerable flathead six at the end of the 1954 model year and didn’t offer another six-cylinder engine until 1964. The sharp recession that began in 1957 sent the pendulum swinging the other way, leading to a new generation of six-cylinder compacts. Pontiac had bucked that trend with the four-cylinder Tempest, but it was clear that the division would need a new six eventually. That also presented an attractive opportunity to explore new ideas. Both DeLorean and motor engineer Malcolm McKellar were intrigued with OHC engines both for their practical advantages (see the sidebar above) and for their rather racy connotations. Although overhead camshafts were very rare for American production cars, they were almost de rigueur for European racing engines and DOHC Offenhauser racing engines had been extremely successful at the Indianapolis 500 for many years. Jaguar was another firm adherent of overhead cams; its XK six (pictured here in a 1963 Jaguar E-Type fixed-head coupé) had dual overhead cams while Jaguar’s later V12 was SOHC. This engine had an enviable pedigree: In competition trim, it won the 24 Hours of Le Mans five times. The direct inspiration for Pontiac’s OHC engines was the contemporary Mercedes big six, a 183 cu. in. (2,996 cc) engine found in the Mercedes 300 sedans and coupes and, in somewhat more highly tuned form, the 300SL sports cars. With its iron block and single overhead camshaft, the Mercedes engine was not as exotic as the twin-cam engines from Jaguar and Alfa Romeo, but it had an impressive competition pedigree and offered a fair compromise between power, fuel economy, and complexity. It became the conceptual starting point for Pontiac’s design work. Great article Aaron! Milt Schornack of Royal Bobcat fame had some good words concerning the OHC six in his book. It appears they did some testing with headers and a tri-power setup on the sprint six engine. It would be quite the sleeper if it weren’t so loud. Pontiac did some similar experiments — the PFST project, developed by Herb Adams, used three Webers and headers. It was a pretty good setup, but it was too noisy to pass muster, and GM had banned multiple-carburetor setups. Grandpa was a Pontiac man for years – I was carsick numerous times as a young boy in the back seat of his 1966 Tempest OHC-6/Powerglide four-door. Years later, the car ended up in my hands, but the top end of the six had already died – I pulled the engine and replaced it with a Chevy 350 and THM350. Always loved that car – the dash was jewel-like with its deep-set gauges, and I always marveled at the “Wondertouch” power steering and brakes. The car is long gone, but I still have the OHC valve cover up in the attic somewhere – always thought it was a true piece of automotive art. Top-end oiling was a persistent problem with these engines when they were new — inadequate flow to the cam covers, particularly when the oil was dirty. I’m told that with modern oil and regular changes, it’s not a big deal, but it killed a lot of cammers when they were new(ish). How does an engine designed by (presumably) capable, experienced engineers make it into production with a design flaw like this? Mac McKellar actually took pains at the design stage to reduce camshaft wear; the lobes were twice the normal width, for example, in an effort to reduce surface pressure. However, hand-assembled test engines may not reveal issues that crop up with assembly-line engines owned by people who only change their oil once a year. 1) Incorrect machining of the metering hole in the restrictor that that controls the flow of oil to the camshaft journals. A lot of ’66 and ’67 engines came through with too large a metering hole, effectively reducing oil pressure to the cam and lash adjusters. This problem could be exacerbated by an incorrectly machined or clogged primary oil passage (the line through which oil flows to the cam cover), which could happen with infrequent oil changes or poor-quality oil. 2) Too rough a finish on the contact area of the cam follower, where the follower actually touches the cam lobe, scuffing the cam. 3) Broken retaining clips. The ’66 and ’67 engines used little metal spring clips to hold the lash adjuster to the cam follower during assembly. This was just an assembly-line convenience; once the cam cover is assembled, it’s not necessary. However, they just left the clip in place on the assembled engines, which would occasionally break when the engine was running, damaging the cam and/or valves with the pieces. The later engines omitted the clips, and simply removing them from the 230 will avoid the problem. This engine should have been an option in the 73-74 Ventura GTO. With an appropriate suspension and steering it would have been an excellent road car for the time and sales would have exploded during the first oil embargo. If GM had let Pontiac keep that engine past 1969, it should have surpassed the pushrod Chevy I6 until the end of the 70’s. Had the people at GM known there was going to be a oil embargo in 73 it would have been a more perfect replacement for the Chevy I-6. Can anyone help with a diagram of the timing marks for a 68 Pont Firebird 6 ohc engine. It would be greatly apprecceiated. Thanks. I thought the cammer poncho was awesome,–especially the Sprint, and I wonder–do blue prints/photos exist for the never-produced DOHC 389? Or even the SOHC 421 & SOHC 428? The tri-power OHC-sprint? Taking a page out of Govt., I wonder what “vices” those jerk-Globalist(imo) Board Members of GM had–evidently none that Delorean was able to exploit. I mention this because Pontiac is no more but for idiots that didn’t want to “ruffle” Govt. feathers, like the moribund Roach and the drooling Donnor-Dumber–two killers of Pontiac-Power, and Legend. I assume the blueprints for those engines still exist in the files somewhere (certainly for the SOHC — as the conclusion mentions, Mac McKellar ended up with one of the prototype engines). It’s possible some of the prototypes are in the Heritage Center, along with other abortive GM engines like the SOHC Cadillac V-12, but I haven’t checked. It’s easy to understand why the SOHC and DOHC V-8 projects ended up not going anywhere, regrettable as it may be. Pontiac already had engines more powerful than senior corporate management thought was prudent; the division didn’t have a NASCAR program where a hot SOHC 421/428 would be really useful; and price escalation and insurance rates were already making the really hot cars unaffordable to most of the kids who wanted them. And that’s without even getting into the emissions certification issues. If the SOHC/DOHC engines had made it out of experimental, they probably would have been roughly as attainable as the Ford SOHC 427 or Chevy’s early Z-11 427 “Mystery Engine.” For the street, a Ram Air 428 or 455 would have been a lot cheaper and probably more practical. I’m afraid I really don’t know — sorry! GM UK (Vauxhall) introduced a belt driven SOHC four engine in 1968, using some design cues from the Pontiac 6, the camshaft in an aluminium housing and large followers, but with solid lifters. Very few European engines had hydraulic lifters then. However it was slanted 45 degrees, more like half a V8, although it helped it fit under hoods more easily. It wasn’t a great design, no more refined or efficient than old fashioned ohv engines from contemporary Ford or BMC offerings, and nor easy to work on either. I suspect some aspects of its design were influenced by Pontiacs development work, can you verify or deny this?. I honestly don’t know — I haven’t looked closely at Vauxhall’s behind-the-scenes history in that era. If I find anything out in that regard, I’ll comment here. If you haven’t already you should check out Vauxpedia that has lots of useful information on what Vauxhall was up to in terms of development. I generally advise caution when it comes to publishing your email address and/or phone number online — if you’re sure you want to do that, I’ll approve it, but I take no responsibility for the potential consequences or flood of spam. Can a base 67 Firebird 6 cylinder ohc engine be modified to be a sprint engine? If so, what reference is available to complete the conversion? I’m not qualified to advise anyone on modifying engines — sorry! I would imagine higher comp pistons and sufficient flowing manifolds along with a hipo carb setup. I just picked up the base overhead cam 6 engine from a 68 Firebird. My Dad worked at the Pontiac dealership when these cars were new. He said the only one that gave cam trouble were the ones the older people had. He any younger people that drove them kept them revved up high enough I guess to keep the cam lubed. I just purchased a ’68 firebird for restoration. I need tghe 6 cylinder overhead cam motor for it. Any for sale? I don’t sell parts, cars, or engines, sorry! Kevin, I need to rebuild my 67 OHC Sprint motor. Where can i find some info on how to rebuild it. I spun a cam bearing and the motor only has 68 K on it. I have read that they starve for oil getting to the cam and will spin a bearing on cold starts ( Do you have any Ideals on how to prevent this? ). hi, if you are still looking I have a ’68 ohc 6 motor may still run been out of car for awhile, I am in Oregon. Yes i have a 1967 OHC out of 1967 Fire bird Sprint rebuild able My email is chrissharon6 [at] msn [dot] com Thank you! I edited your email address to make it slightly less machine-readable — if you really want me to put it back the way it was, I will, but I take no responsibility for the spam-bots of the world! do you still have the sprint motor? It’s a damn shame that GM is such a bullheaded company when it comes to innovation. My first car was a Pontiac LeMans bought from my grandfather. It had the OHC six 2-barrel. I enjoyed the car for a year and then sold it to my parents. They had to rebuild the top end twice and finally junked it at 67,000 miles. The cam design was definitely flawed. Interesting to read all the knowledgeable comments about this engine. I worked, as a mechanic, at a Pontiac dealer and was excited when these cars stated coming in to be sold. They drove well and were economical. A few months later the only excitement was trying to keep them from eating their overhead cams. I could not believe that GM would release such junk. hi, i have 66 tempest custom still has the original engine ZD CODE that came factory in it with the optional four speed, it has 98.000 miles on it, at 80.000 miles had to put cam assembly on the engine, but she run’s just fine, and the only rust spot’s are at rear glass and above back bumper, floor’s solid, and i have rare 67 firbird ohc 6 sprint that came factory with transistorized ignition, the amp box mount above the heater, and it has the factory wiring, do you have something like this, tell me about it thank’s k.t. Can anyone confirm an attempt to extend the Pontiac OHC engine lifespan in Australia powering Holdens that soon fell apart once it was revealed to be close in power to Holden’s own V8 during that period? A pity it never lived on particularly in Australia along similar lines to the Australian versions of the Ford Straight-6 that eventually became the Ford Barra engine (topped with 320-420 hp 4.0 Turbo variants). I’ve never heard anything about that, although it does sound reasonably plausible. (I assume such a thing would not have been the Pontiac OHC six per se, but rather a similar OHC conversion of the existing Holden six, so as to preserve as much of the original tooling as possible.) There’s certainly a lot of precedent for that kind of thing. Of course, given how much GM-Holden probably spent tooling for the locally built V-8, I can see how they would ultimately have decided not to also go forward with an extensive revamp of the existing six, especially if it produced similar power. Loved your article on the OHC6. I’m still driving my 1967 LeMans, 2-door hardtop. Tahiti blue, OHC6,1-bbl Rochester carb, with the 2-speed power glide transmission. I bought her new in December, 1966, in Austin, TX. I drive it monthly with more than 178.000 on her. She’s 100% original with the same hub caps, gas cap, car keys, interior, etc. I overhauled the engine in 1979. The timing belt, with 142,000 miles on it, actually looked good. She still has the same cam and lifters. The main reason I still have this car is it’s beautiful design, at any angle, as well as such an easy driver. I just wanted to talk about Becky Blue (her name) since she’s at the New Braunfels Classic Car Restoration shop for a complete redo. It’ll be her 50th birthday coming due soon. I have always liked these Pontiac OHC sixes. I never owned one, but I did come close to obtaining a very old and beaten up 67 Lemans Sprint back in the 80s. These engines are very cleverly designed, and I still do not understand how they are more expensive to make that the corresponding Chevy stove bolt 6. For instance, the block is very simple: There is no machining for a cam, oil pump, lifter bores and lifter galleries, fuel pump, and a distributor. The oil pump, distributor, and fuel pump are mounted on a die cast aluminum assembly (somewhat analogous to the die cast front ends on Cadillac and Buick V8s). All of this was driven by an auxiliary shaft that was, in turn, driven by a pulley that was also used as the cam belt tensioner. This whole assembly moved up and down on a pad, machined on the lower right side of the block and was held to the block by four bolts working in slots in the die cast assembly. The whole assembly could be moved up and down against the block to achieve the proper cam belt tension. It was prevented from tilting out of alignment by a slot milled into the pad on the block and corresponding key in the assembly. Like the four mounting slots, inlet and output oil galleries in the block matched with slotted passages in the assembly. It seems to me that casting and machining a die cast part is less expensive than performing similar operations to make cast iron parts. There is more expense in making and setting up gears to drive the cam (as in the Chevy 6) than in making pulleys and a timing belt — this is even cheaper than making sprockets and a silent chain, as some other 6s used. The cam is held in another die casting, again, easier to machine than a cam in a cast iron pushrod block. I see this engine as being very adaptable to all sorts of uses, from a heavy duty truck engine (longer strokes could more easily be accommodated in a higher block that used the same tooling as the car block) and head design would be practically unlimited, with later aluminum technology, a cross flow head, and even a DOHC head. Performance, in other words, could be easily manipulated more cheaply than in the normal pushrod design. Unfortunately, Detroit’s lack of attention to engineering a reliable design was capitalized on by companies like Toyota and Honda, who found cheaper ways to make better parts and, much to their customers’ delight, didn’t expect their customers to do their trouble shooting for them. A word about the “Y Block” design of the block (and Y Blocks, as well!). Deep skirted blocks, so despised by the Cfhevy-Synchophant car rags, was a design used by GM, as well, such as the Small Block and Nail Head Buicks, in Chrysler’s B and RB V8s, and AMC’s old 287/327 V8s, besides Ford’s Y Block, Lincoln Y Block, FE, MEL, and SD truck motors. The purpose of the deep skirt is not to provide a means of using cross bolted main caps to increase the strength of the main caps, as those aforementioned car rag writers would have us believe. First of all, the purpose of cross bolted mains wasn’t to reinforce the main caps. It was to keep the main caps from “walking” on their seats and consequently allowing the mains to spin. This was a problem when slamming a two-ton stock car into a high speed corner at nearly 200 mph and then letting off of the throttle. The forces in the block are tremendous in this case, and anchoring the main caps was the problem. Ford FEs and Mopar 426 Hemis accomplished this by tying the main caps to the deep skirt with cross bolts. Pontiac, back in the early 60s, accomplished the same thing by using four bolt main caps on their skirtless V8 blocks in the early 60s — something Chevy later copied to solve similar problems. Furthermore, in a V8, it can be argued that the “Y Block” deep skirt does directly support the crankshaft partially, as it is clear (contrary to the silly arguments made by the most famous car rag) that in a V8 engine, the crank isn’t being pushed out the oil pan opening, it is being pushed at a 45* angle to perpendicular. This, however, is immaterial in an inline six. A famous inline six made by GM that used the deep skirted “Y Block” was the old Detroit Diesel, such as the common 6-71. The deep skirt is used to strengthen the engine longitudinally, which is why this design is quite common in many engines today. Regarding the Pontiac OHC 6, it would give the engine the durability needed in its high performance garb to push relatively heavy intermediates and pony cars around with surprising performance. Regarding the question posed by one of the posters in this thread, the Sprint engine differed from the base six, not only in having higher compression and a Rochester 4v Quadrajet, but in having a more radical cam and different, stronger rods. The block also has room to accept the long-stroke Chevy 292 truck inline six crankshaft. John Z DeLorean had admirable skill as an engineer, and this Pontiac engine is part of his legacy, along with other automotive designs you have related to us on this sight. It’s a shame that his business ethics didn’t match his skill, but the Pontiac OHC 6 is a design I’ll always admire. Have you ever heard of, or do you have any information about, an over head cam engine based on the Corvair horizontally opposed six cylinder engine? This engine was proposed for the GM Astro I show car in the mid 1960’s. 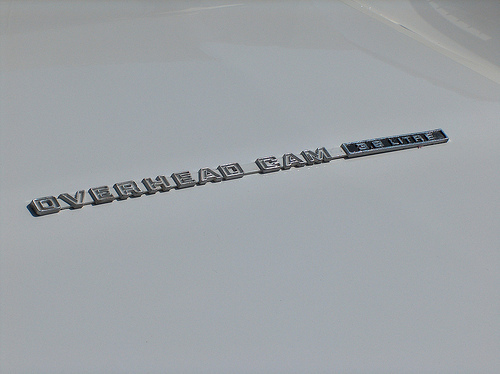 The over head cams, one on each cylinder head, were belt driven, similar to the Pontiac’s OHC 6. This engine would have been in development around the time of the development of the Pontiac engine. The Astro I is mentioned briefly in the Corvair article and I think in the Opel GT story as well. Detailed information about its engine is surprisingly sparse. As far as I could gather, the show car didn’t actually have a running engine (not atypical for concept cars) and it’s not clear if there was a running version of the engine; it does not appear to have been a serious production prospect. It was notionally based on the existing Corvair engine, but taken out a bit in bore (which probably would have meant new cylinder barrels) for a displacement of 176 cubic inches. I have no information on the belt drive. Aaron, thanks for the info. I had an occasion to sit (or rather, repose, because of its laid back seating position) in the Astro I, but it was almost 4 decades ago, and although I knew of the significance of the car at the time, I didn’t memorize all details about it. I did notice it had sloppy spot welds in the engine compartment. The car did not run in our presence, so I can’t verify if whatever engine was in it was runnable. I understand that it now has a common 140HP (four Rochester H carbs) engine, mainly because somebody got tired of pushing it all over the place. I’m working with someone who is working with someone who insists there are six or seven operational Cammer engine prototypes in the wild (outside of GM), and he insists that he absolutely must have one. As you indicate, there is very sparse information about this engine. Someone claims to have the blueprints for this engine, but I’ll bet he has the blueprints for the experimental Rochester fuel injection Corvair engine. I have seen those, as well as a box of parts (but not assembled on an engine). I was hoping you might have had some insight or leads as to a direction of information about the Cammer engine, but you are reinforcing the concept that there is simply nothing out there to be had. I thank you for your info and response. If there were any operating prototypes, I’ve never heard of any — which doesn’t mean they don’t exist, necessarily. It’s certainly conceivable that Chevrolet engineering (or the corporate Engineering Staff) toyed with the idea of rigging up an OHC Corvair engine, but whether it got beyond paper plans and mockups, I don’t know. (The divisions in those days had “Advanced” engineering budgets for R&D projects not necessarily intended for production.) 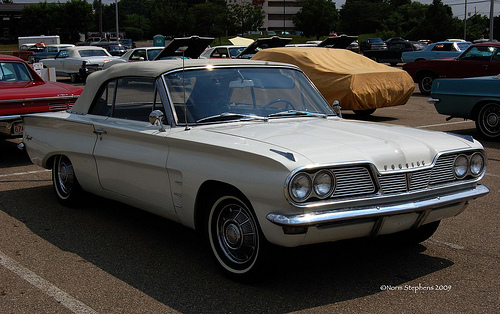 By the time the Astro I was built, the likelihood that Chevrolet would have seriously considered a more expensive high-performance version of the Corvair engine was pretty remote. Who has blueprints on the experimental cross-flow DOHC Pontiac-6? Those could be 3-D’d via sintered metallic powders & triple-lazers in a metal-substrate 3-D replicator. The greatest cost would be the alumno-titanium sintered powders. Is there a Pontiac Museum where a example may lie? A portible scanner could obtain enough info to replicate a DOHC alloy-head, and I would expect the patents have long expired. I got to own a 69 Firebird Sprint in the late 70’s early 80’s. Swapped 3 speed manual to M 4 speed and changed rear gears, not sure of #’s. Not the best off the line but it was sweet from 15 to 110. One of the funnest highway cars I have owned. Had to sell do to way to many tickets but I still smile thinking of that sweet ride. I owned a 1966 Tempest Sprint option, 3spd, 3.55, standard steering, brakes, etc. Went like crazy on the highway. I put 69,000 miles on it with no problems whatsoever. Drag raced it quite a bit and used nothing but Kendall GT-1 racing oil. I then purchased a 1968 Tempest Sprint with the same set-up, plus 15/1 steering ratio, heavy duty rear axle and traction-lock differential. It was a 250 cube and was a much better engine for off the line. I managed a record run with it at 15.29 at 86 miles per hour. With a fours speed and 3.90’s I could have easily got down into upper 14’s. Put 68,000 miles on it and also had no problem with the engine. Well get this… Mac McKeller was my cousins husband… he was a wonderful person to know and ride with in those new GTO take home cars… yep at 17 I had the pleasure of riding with him every night in a new car for a week while I visited with my relatives… God bless Mac and the rest of my family. Enjoyed reading all the responses here.I bought my first new car in July of 68, a Lemans Sprint optioned 3 speed, metalflake Verdoro green with y paunchet white interrior.First week I owned it , it developed an severe oil leak at the external oil pump housing – apparently not sealed correctly at the factory.I never had another problem with the car – drove it daily for 7 years and put 105, 000 mileson it.w What a really nice and fun car to own A totally reliable car and a lot fun to drive. I will own anot one some day. I have ridden more than a few miles in Pontiac OHC 6 powered cars. One was a Tempest with the base engine and automatic transmission. The other was a Firebird with the 215hp version with 4spd. The Tempest acted almost like a comparable Chevelle with 6 and auto, but in the upper rpm ranges a little peppier. The Firebird on the other hand sounded like a 6 but went like a V8. One night while speed shifting my friend left the rear end in pieces over a 150ft stretch of road which forced us walk 7 miles in the dark starting a 12:30am. Never heard of anyone else blowing a rear end with a six cylinder engine. In my opinion GM really screwed themselves royal by letting this engine die. It worked fairly well and most of the teething problems had been worked out by the time they let it die. When they needed newer and different engines due to gas crisis and other events they could have used this as a blueprint for a 4 cylinder OHC engine and refined it for use in the larger downsized cars without having to reinvent the wheel. The original Pontiac Tempest with a 4 cyl engine had the engine created by loping off one bank of the V8 engine Instead they drunkenly lurched from one disastrous engine to another and in the process with all the other missteps destroyed the worlds largest and most profitable car company. One engine alone wouldn’t saved GM but it would have greatly helped as not to have to reinvent the wheel. One night while speed shifting my friend left the rear end in pieces over a 150ft stretch of road which forced us walk 7 miles in the dark starting a 12:30am. Never heard of anyone else blowing a rear end with a six cylinder engine. WELL…we scattered the AMC 15 rear end with a stroker 4.9 based on that OHV engine…still running about in millions and millions of Jeeps! Cured it by installing the Mustang 8.8. The engine that comes even closer to the Mercedes is all of the L- series Nissan engines. L1300-L2000 4 cyl and the L2400- L2600 and L2800 six cylinder. We even use the same special valve adjusting tool for both engines! Are the engines still available? Where are they located? do you still have any of the Pontiac 6cyl motors for sale ? Our second new car after we were married was a 1966 Tempest wagon with the OHC six and standard transmission. I really enjoyed that car and there was just something nice about the one piece chrome plated shift lever! But the oil rings failed after 44,000 miles and oil was spraying out of the breather-filler all over the engine compartment. Rather than spend money on an out-of-warranty engine rebuild, I traded it for 1968 Chevy BelAir wagon. Memories! I bought a ’68 Firebird Sprint OHC 4 barrel new in 1968. It was a disaster. It *drank* oil through the valve guide seals. When it got down to 400 miles/qt (making it essentially a 2-stroke) the dealer would replace the valve guide seals. I did this 4 times under the warranty, and then got rid of the car. Currently working on restoring a 68 FB Sprint with OHC six. I need some help with steps to pull the motor to replace all of the gaskets and seals as a result of an oil leak. Any help would be great as the last time I pulled the motor was in 1983 and I completely forgot what I did. The Sprint was fun and ran with the Mustangs of the time but fuel mileage was awful, although we normally didn’t worry about it back them. A friend bought what must have been a one-of-a-kind, special-ordered ’66 Chevy wagon with a 427 with full synchro 3-speed column shifter. It was insanely fast and the ultimate sleeper. GTO Pontiacs were its favorite food. I followed him from Phoenix to Durango CO once for a camping trip. He was loaded with camping gear, a wife and two Newfoundland dogs. I had a wife, infant kid and a suitcase. In the mountains I had a tough time keeping up with him and when we filled up, he got better mileage than I did. He probably weighed nearly twice as much as I, had twice the engine displacement and essentially the same carb. Memory fails to recall the exact engine problem that caused me to dispose of the car; a valve problem of some sort. Great article, learned everything about my (former) ’68 Sprint I wanted to and much more! If only I could get her back, sigh. Given what Ford of Australia did with the Straight-6 / Barra engines, GM missed an opportunity to improve on the engine by having an updated OHC layout filter down to the related Chevrolet Straight-6 (plus 153 4-cylinder) while spawning more potent Twin-Cam variants to replace the Pontiac OHC-6. They certainly did. At the time, GM corporate saw the OHC six as an unnecessarily expensive elaboration of an economy engine nobody really wanted anyway, but the picture would have looked quite a bit different five years later! A lot of the divisions played with OHC and DOHC concepts during this period, although it appears most of them were conceived as ultra-performance engines of a kind that wasn’t necessarily compatible with early emissions controls (at least with carburetors). However, even when that was addressed through electronic injection and feedback response systems, GM remained weirdly resistant to offering engines of that kind for a surprisingly long time. Low-revving pushrod V-8s and big sixes matched to automatic transmission seemed more their comfort zone. OHC mainstream cars didn’t really catch on in Europe until the 1970’s. The BMC E series engine in Austin Maxi’s and allegro’s, Fords into sohc offered in 1.6 and 2.0 liter sizes in Cortina’s and Capri’s joined the GM Vauxhall in the market all around 1970, Renault an Fiat also had OHC engines available. But many cars soldiered on with old fashioned ohv engines into the 1980’s and even beyond in a few cases. Most push rod engines could keep up with ohc engines for power and economy for everyday cars, it wasn’t until the European emissions regulations came int force in the 1990’s that manufacturers were essentially forced to adopt an ohc, and later, dohc layouts with the extra costs involved to meet the new requirements. One offshoot of this is modern engines with proper maintenance will outlast the older engines by a massive margin. Quarter million mile engines are far from uncommon, back in the day 100k miles was a fair life. Strange GM were reluctant to properly develop a long running ubiquitous engine, especially from the 3rd generation onwards. The same could be said of Chrysler as well with the Slant-6 despite them actually looking as properly developing the Slant-6. Given what the likes of Austin did with their copy of the 2nd generation Straight-6 (plus distantly related downsized engines), it could be argued GM actually had an almost perfect engine in the Straight-6 from which to develop and spawn related engines in a myriad of ways at relatively little cost. Well, yes and no. The big Chevrolet six was a fairly bulky, heavy engine to begin with and the Pontiac OHC version was more so. Even with the OHC, the 250 was not an especially free-revving engine, nor was it very economical by the standards of the ’70s (although for panicky buyers circa 1974, it would probably have seemed pretty good). The born-again Buick V-6 was lighter, a good deal more compact, and more easily adaptable to transverse FWD applications. The Striaght-6 as well as the related 4-cylinder would obviously be restricted to RWD models even with OHC/DOHC. That said GM could develop downscaled 4/6-cylinder versions of the Chevrolet 4/6-cylinder engines (or downscaled even further), roughly envisioned as being essentially a GM equivalent of the BMC B-Series (plus O/M/T-Series or Nissan J engine) without the involvement of Harry Weslake. Agree the Buick V6 is more adaptable to transverse FWD applications, yet a pity the closest GM ever got to a 60-degree V6 for passenger cars prior to the 1979 60-degree X V6 was a theoretical 60-degree V6 derived from the shelved 1960s Cadillac V12 prototype. Scaling down an engine is not a trivial matter, though, and is not necessarily desirable in a number of respects. There are three frequent results: a modest reduction in the weight or dimensions of an existing engine that doesn’t really justify the expense (e.g., the version of the BMC C engine used in the MGC and Austin 3-Litre); a lighter but weaker version of an existing design (e.g., the Pontiac “301”); or else creating a miniature version of an old engine that can’t share much if any of its progenitor’s tooling. The C-Series was actually completely unrelated to the B-Series because it was a pre-merger Morris design, with possible roots to the post-war SV Morris Six MS and OHC Wolseley 6/80. 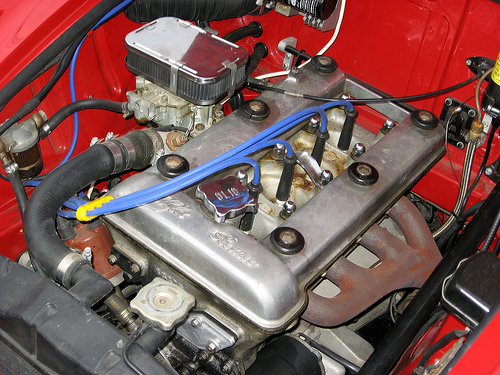 A 2-litre 6-cylinder version of the 1.2 4-cylinder Austin A40 engine (which formed the basis of the B-Series) was considered, with the intention to use as many common parts as possible to keep manufacturing costs as low as was consistent with reliability and servicing costs of the units. However it was not pursued due to the Austin 16 hp / Austin A70 being powered by a 2.2 4-cylinder, which was derived from Austin’s copy of the 2nd generation Chevrolet Straight-6 known as the Austin “D-Series” (making it a sort of 2nd gen-based 153 4-cylinder that spawned dieselized variants in taxis and powered the original Big Austin-Healey). Though a UK developed 6-cylinder B-Series never happened. The Australians later developed a 80-84 hp 2.4 6-cylinder B-Series known as the Blue Streak engine, while the Japanese built a 109 hp 2.0 6-cylinder B-Series copy called Nissan J engine. Interestingly during development of the MGC it was established the 2.4 Blue Streak 6-cylinder B-Series was not only significantly lighter and more compact compared to the Morris developed C-Series, but also capable of putting out 115 hp up to a maximum of 128 hp on the dyno. Could see GM initially developing a downscaled 6-cylinder at the lower-end of the North American market (followed by a 4-cylinder) possibly in place of the Chevrolet 153 4-cylinder, with Envoy models and even Opel (pre-CiH) utilizing both 4/6-cylinder engines. Such engines could have also evolved along similar lines to the B-OHC prototype and O/M/T-Series petrols as well as the Perkins and L/G-Series diesels with a very long production life. I wasn’t implying that the C-Series six was related to the B engine; my point was that it illustrates the practical limitations of trying to scale down an existing design while preserving the tooling. Again, there’s a clear temptation with these things to look at in engineering terms (or performance engineering terms) what are predominantly manufacturing problems. The primary reason GM or, to Roger’s point, Ford of England/Ford of Europe clung to old designs was that it was the path of least resistance from a production standpoint, not that they weren’t able to come up with better designs. For instance, GM’s North American divisions were not building any Opel engines (other than the handful of 327s Chevrolet built for Opel for the Diplomat 5,4) and were not equipped to do so. Therefore, using Opel engines would have meant either buying them from Germany or extensively reengineering the design for North American manufacturing and setting up a completely new line, at which point there was little incentive to use the existing design rather than something homegrown. It had very little to do with the superiority of the design. Also, I have to underscore again that until the late seventies and early eighties, it was very rarely a matter of “GM” developing something and more a question of whether an individual automotive division considered something worthwhile enough to put some resources into developing AND was able to convince corporate management to fund it. There was not a single unified engineering arm (or even North American engineering arm) doling out engine designs and deciding what the corporation as a whole might need. It was very different from Ford, Chrysler, or most European or Japanese manufacturers in that respect. Given the C-Series likely roots, an earlier 1.5 4-cylinder version was developed via the SV Morris Oxford MO and Wolseley 4/50 (with a 1.1 OHC was developed though not produced), additionally 4-cylinder OHV versions were developed though not pursued in 1750cc and 2-litre forms for the mk2 Morris Oxford and MGB (with some alleging the prototype engines were comparable to the Volvo B18 / B20 units). Had the merger with Austin never happened, came about later or under more equal circumstances (where Morris was not the weaker partner by investing like Austin did beforehand), it is likely a downscaled “A-Series” equivalent would have been developed to replace their own pre-war SV / OHV engines (that were essentially copies of the Ford Sidevalve engine). The post-war Morris Minor was originally intended to be powered by the 918cc Wolseley Eight OHV and would have received a 960-1000cc version had the merger not happened, with Morris engineers claiming it was better then the A-Series that replaced it. While understanding where you are coming from with each GM marque / subdivision having their own engineering arm and relative autonomy, the point is using downscaled engines derived from the Chevy Straight-6 / Pontiac OHC-6 (and related 153 4-cylinder would have negated the need for importing Opel engines and placed GM in a better position by the time the 1970s fuel crises hit. They would have not have to use Isuzu engines nor potentially even the Vega or Iron Duke engines at the lower-end of the range, as all could have been adequately taken over by a range of small 4-cylinder petrol and diesel engines (with distant scope for a 5-cylinder variant). The small 6-cylinder likely being pensioned off to South America and markets due to GM adopting the Buick V6 and other V6 engines. Here’s the thing: Chevrolet only offered the 153 four in the U.S. very grudgingly, and I don’t think production was ever very great. It was one of those things that was useful to have in the catalog, but that dealers didn’t want to order except maybe to have a bottom-of-the-barrel price leader for newspaper ads (“Prices as low as …”), and that sold in tiny numbers. Under those circumstances, having it be a derivative of the Nova six, sharing a lot of off-the-shelf parts, made sense. It was a minimal-investment option, and any significant variations from the engine on which it was based would have defeated the purpose. Had there been greater utilization of it, that picture would have started to change. Producing several different engines on the same line requires less capital investment, but it can really tie up production. At some point, it forces a decision on whether to kill the less-popular/less-profitable option or set up a second production line. If Chevrolet had decided they really needed a small four (which by sixties standards would have meant “2.0 to 2.5 liters”) in sufficient numbers to justify setting up a unique line, there would have been no particular advantage to maintaining the architecture of the 153/230 engines and various reasons why it wouldn’t have been desirable — too much weight and too much bulk for the sort of applications in which it would have been useful. And indeed that’s sort of what happened with the Vega 2300 engine, although that wasn’t conceived by Chevrolet. Chevrolet could undoubtedly have come up with something better, or at least less troublesome, but the old 153/230/250 family architecture would not have been either terribly useful in terms of addressing the logistical questions or in terms of performance. Broader use of the OHC version of the 215/230/250 engine — not scaled down, just a tidied-up version of the Pontiac six — would have made sense in the ’70s, but as a more economical alternative to low-end V-8s in X-body, A-body, and low-end B-body cars, not as a substitute for a decent, modern four or small six for cars like the Vega or the H-body compacts. The 153 was fitted to South African versions of the Vauxhall Viva HC called the Chevrolet Firenza including a 2-litre version (and opens up the possibility the engine could easily fit into similarly sized T-Car Chevette). Which makes one wonder if the 153 engine could have been fitted into larger Victor FB / FC / FD models, slotting both the Chevy II / Nova and Corvair either as an entry-level Chevrolet (if built in the US) via some early form of TASC or as more unique Envoy models. Agree with broader use of a properly developed Pontiac OHC-6 though would include smaller 181, 194 and 215 variants as well as equivalent Pontiac OHC-4 engines (particularly in 2-litre OHC-4 form), with the Australians embracing such an engine in place of the old Holden Six and later updating it to feature DOHCs. Must have been 7th or 8th grade when I first came into contact with an older kid who had a beautiful 66or 67 Le Mans Sprint that could outrun V-8’s. I have been a fan ever since but have not owned one. It seems these engines would be unusual replacements for cars that originally had Chevy 230’s and 250’s. Sad that many were tossed and replaced by V-8’s. I would like to replace my Impala’s 250 with an OHC-6 Sprint or even a base one. I have owned a number of the Chevy sixes, an Opel GT, a slant six Volare, 3.8 Transport, and two of the Vortec sixes in my GMC Envoys. I guess I am a “six” guy! (Only 2 V8’s in my lifetime, 283 sbc and an Olds 350) This was a fascinating string of comments and replies, thank you.